Hi! Im currently studying(again) for the BUS403 final exam. Can anyone give me suggestions as to what I should concentrate on? This particular class has in my opinion too much information and it does not tell you exactly what should be focused on. PLEASE HELP!!! Hello There! I am so sorry you are frustrated and thank you for reaching out! There is a lot of good information in this course. Have you taken a look at the course study guide? We just uploaded it so you may have missed it! You can scroll to the bottom of the course or just click on this link at https://learn.saylor.org/course/view.php?id=68&sectionid=642#section-85. I would love to hear if you find it useful since we are working to create study guides for all of our courses and I am hoping the format is helpful to you. Thank you and please let me know how it goes! Hi Christine! Thank you for responding to my post. I have used the study guides. I am currently reviewing those again before attempting to take the exam for the third time. The study guides tend to be a bit all over the place and not very cohesive which makes it a bit harder to focus in on certain topics. Yes, I can see why you say that. 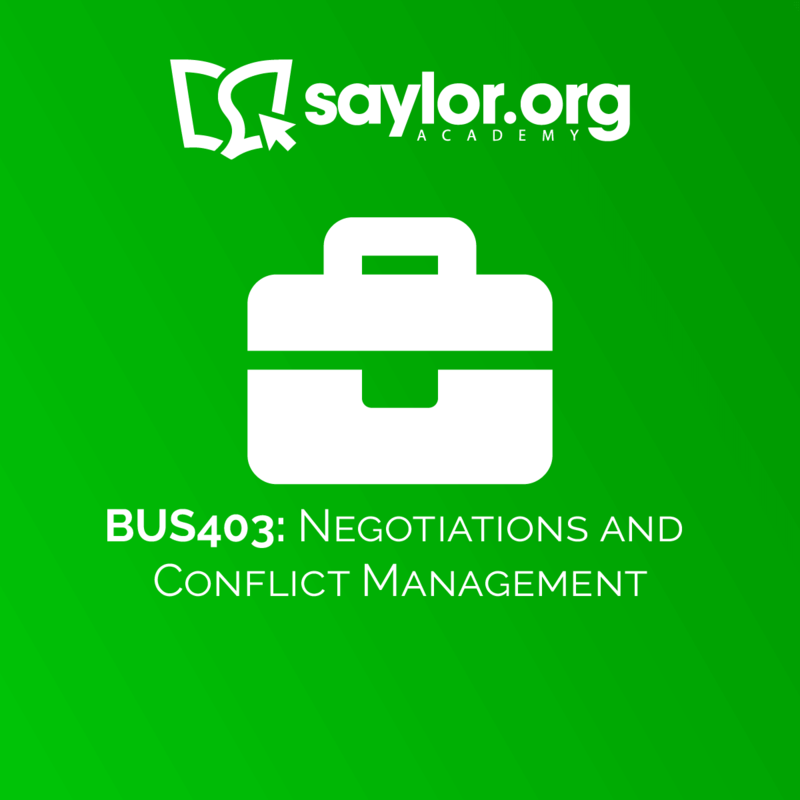 This is a really complex topic – there are so many aspects of negotiation and conflict resolution and I can see how it may have been difficult to organize everything that needs to be included in a comprehensive way. So I encourage you to just move thoughtfully through all of the material, think about how the concepts relate to your own experience, and anticipate situations where you might use them in the workplace if you haven’t seen them already. For example, try to use the material to inform how you might be able to enter a negotiation (whether if you are buying a car or negotiating a salary contract) or resolve a conflict (whether with a neighbor or with someone you disagree with in a work setting). This will help you remember all of the different topics and scenarios. Let me know how it goes! There is a lot of really good material in this course, but I agree that it was probably difficult to organize! I love to hear your feedback.